Just a few picture this week! Last Saturday we colored Easter eggs. We had a little girls afternoon yesterday. Parker needed a hair cut and she just so happened to want it short. So she ended up with 3 inches off of her hair! She loves it. I do, too. She just looks so grown up now! She got a complimentary nail painting with her hair cut...and since Grace didn't need a haircut...I still let her get her nails painted. 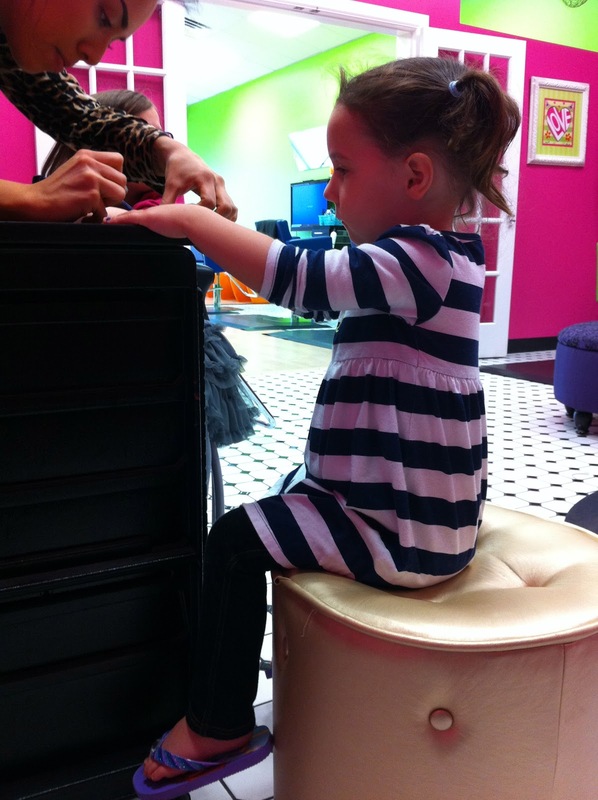 She loves getting her nails painted. And she just looked so darn cute sitting on that stool with her legs dangling. She picked out a navy blue and a hot pink and the lady alternated the colors between fingers. Love this little girl!! (even though, yes, she was up THREE times last night). Grace's pictures are on the left. I just can't get over those sweet little feet and toes being painted. Parker is on the right....she sat across the way from us and was such a good big girl. That's it from our week. We have a very full weekend and full week next week. looks like a great week! popping over from instafriday. your blog is cute! both my girls looked super grown up when we cut their hair. bittersweet.